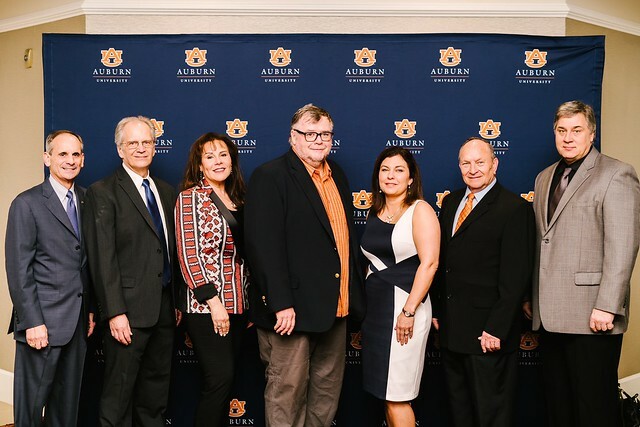 Auburn University recognized faculty members with the university's highest honors at the Faculty Awards ceremony Wednesday, Feb. 28, at The Hotel at Auburn University and Dixon Conference Center. The awards honor some of the institution’s most innovative teachers, researchers and scholars for their unique and distinguished contributions to the university’s mission. Christy Bratcher, associate professor in the Department of Animal Sciences in the College of Agriculture, and Kelly Jolley, the Goodwin-Philpott Professor in the Department of Philosophy in the College of Liberal Arts, are the recipients of The Gerald and Emily Leischuck Endowed Presidential Awards for Excellence in Teaching. Gerald and the late Emily Leischuck, 1964 graduates and retired Auburn University administrators, created the Endowed Presidential Awards for Excellence in Teaching in 2005 to recognize two full-time, tenured faculty members who have demonstrated effective and innovative teaching methods, along with a continuing commitment to student success through advising and mentoring. Ken Halanych, the Schneller Endowed Chair in the Department of Biological Sciences in the College of Sciences and Mathematics, and Chris Newland, professor in the Department of Psychology in the College of Liberal Arts, are the recipients of the Creative Research and Scholarship Awards. The awards honor the research achievements and contributions of faculty who have distinguished themselves through research, scholarly works and creative contributions to their fields. Donald Mulvaney, associate professor in the Department of Animal Sciences in the College of Agriculture, is the recipient of the Award for Excellence in Faculty Outreach, which recognizes the engagement of exemplary faculty members and demonstrates the tremendous impact outreach has on the community, state and nation. Mona El-Sheikh, the Leonard Peterson and Co., Inc. Professor in the Department of Human Development and Family Studies in the College of Human Sciences, is the recipient of the Research Advisory Board Advancement of Research and Scholarship Achievement Award. The award recognizes high-quality, competitive research and scholarly activity that exemplifies and advances Auburn’s research and scholarship mission. The Research Advisory Board includes more than 40 industry professionals from across the country who actively support the university’s efforts to enhance its research and scholarship culture. The recipient of the Alumni Undergraduate Teaching Excellence Award is Kevin Moore, associate professor in the School of Architecture, Planning and Landscape Architecture in the College of Architecture, Design and Construction. The Alumni Professorship program recognizes tenured faculty members with direct responsibilities in two or more of the institutional missions of instruction, research and outreach. Faculty selected to receive a professorship must have demonstrated exceptionally meritorious performance, distinctive competence and potential for continued high productivity and excellence. The 2017 Alumni Professors are Zhongyang Cheng, professor in the Department of Materials Engineering in the Samuel Ginn College of Engineering; Robert Boyd, professor in the Department of Biological Sciences in the College of Sciences and Mathematics; Scott McElroy, professor in the Department of Crop, Soil and Environmental Science in the College of Agriculture; and Kira Bowen, professor in the Department of Entomology and Plant Pathology in the College of Agriculture. Henry Kinnucan, Alumni Professor in Agricultural Economics and Rural Sociology in the College of Agriculture, is the recipient of the Distinguished Graduate Faculty Lectureship award. The award is jointly sponsored by the Auburn Alumni Association and the Graduate School and is awarded to a faculty member on the basis of excellence in research. The recipient of the Provost Award for Faculty Excellence in Undergraduate Research Mentoring is Sushil Adhikari, Alumni Professor in the Department of Biosystems Engineering, College of Agriculture. Established in 2012, this award recognizes faculty who demonstrate a strong commitment to undergraduate research, whose efforts support Auburn students interested in careers in research and creative works and who have demonstrated outstanding service to students. The Gary Brown ePortfolio Project Faculty Cohort Award recipients come from the Department of Biosystems Engineering in the College of Agriculture. They are Oladiran Fasina, department head and Alumni Professor; Sushil Adhikari, Alumni Professor; Puneet Srivastava, professor; Mark Dougherty, associate professor; and Timothy McDonald, professor. The award recognizes teams of faculty members who have exhibited the spirit of collaboration and professional development promoted by the faculty cohort model, shown leadership in promoting the project, and are engaged in practices that support the implementation of ePortfolios at Auburn. The Aquaponics Working Group is one of two recipients of the President’s Outstanding Collaborative Units Award. Honorees are Terry Hanson, professor and Extension specialist in the School of Fisheries, Aquaculture and Aquatic Science in the College of Agriculture; Jesse Chappell, associate professor and Extension specialist in the School of Fisheries, Aquaculture and Aquatic Science in the College of Agriculture; Tung-shi Huang, professor in the Department of Poultry Science in the College of Agriculture; David Blersch, assistant professor in the Department of Biosystems Engineering in the College of Agriculture; Daniel Wells, assistant professor in the Department of Horticulture in the College of Agriculture; and Glenn Loughridge, director of Campus Dining. The Food Entrepreneur Working Group is also a recipient of the President’s Outstanding Collaborative Units Award. Honorees are Jean Weese, professor in the Department of Poultry Science in the College of Agriculture and associate director of the Food Systems Institute; Christy Bratcher, associate professor in the Department of Animal Science in the College of Agriculture and director of the Food Systems Institute; Terry Hanson, professor and Extension specialist in the School of Fisheries, Aquaculture and Aquatic Science in the College of Agriculture; Patti West, outreach programs administrator with the Alabama Cooperative Extension System Food Safety Team; Glenn Loughridge, director of Campus Dining; Jacqueline Kochak, communications specialist for the Auburn University Food Systems Institute; Karen Hunley, communications specialist for the Auburn University Food Systems Institute; and Regina Crapps, academic programs administrator for the Auburn University Food Systems Institute. Created in 2011, the award recognizes existing faculty collaborations among two or more departments, divisions, offices or programs within the university. To be considered, the work of the collaborative units must have advanced the excellence, impact and reputation of representing units and the university as a whole. Auburn University’s Departmental Award for Excellence in Education is awarded to the Department of Physics in the College of Sciences and Mathematics. Created in 2013, the award is administered on behalf of the Office of the Provost through the university’s Biggio Center and the University Senate Teaching Effectiveness Committee. The award recognizes the efforts of departmental faculty for their commitment to improving education at both the undergraduate and graduate level. Read more about faculty awards at http://ocm.auburn.edu/faculty_awards. Auburn University honored faculty members during its annual Faculty Awards ceremony Feb. 28. Pictured, from left, are John Mason, vice president for research and economic development, and award winners Chris Newland, Mona El-Sheikh, Kelly Dean Jolley, Christy L. Bratcher, Donald Mulvaney and Kenneth M. Halanych.